Some 42 newsrooms across Ohio are participating in a community engagement project called Your Voice Ohio that was conceived during the 2016 election season. The Jefferson Center, a nonprofit that tries to help citizens become more informed and participate in democracy, held three events with eight news-media partners. "Reporters met with citizens in northeast Ohio to find out the ways in which people wanted the election and the candidates to be covered and how they expected news organizations to provide them with information," Mădălina Ciobanu reports for Journalism.co.uk. After the election, Jefferson Center Program Director Andrew Rockaway told Ciobanu that Ohio news organizations saw the events and realized they needed to listen more to voters and find out why they felt the way they felt. The project has held eight community conversations, each lasting about two hours and attracting 100 to 120 people. Participants break into groups of five or six, with a reporter at each table, and share what the opioid epidemic looks like in their community, what they see as the cause of the epidemic in their community, and what steps they could take to fight it. Project coordinators research topics that come from those discussions, and plan to use platforms such as Hearken and GroundSource soon to reach out to people who are less likely to attend events but still have something to say. 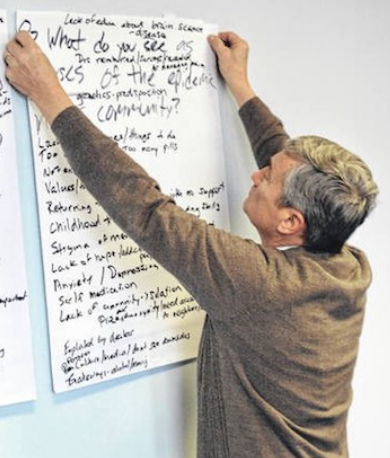 "The aim is to find out what best practices and solutions are being employed in other communities around the world and collect them into databases that can be used to develop a solutions-focused approach to reporting on the opioid crisis," Rockaway said.